At last, 25 years after its premiere, I finally got to see and hear John Adams’s first opera, Nixon in China. San Francisco Opera gave this a fine production. All the singers were excellent, but Hye Jung Lee made a particularly outstanding impression as Madame Mao, in a role that is a 20th-century Queen of the Night. 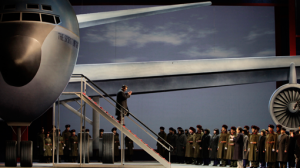 Nixon in China was a landmark in American opera. It’s perhaps the first grand opera on American subject matter written by an American composer to enter the opera repertoire. It showed the way for composers to write operas that dealt with historical subjects from the recent past, including three San Francisco Opera commissions that I got to see during their premiere runs: Jake Heggie’s Dead Man Walking, Christopher Theofanidis’s Heart of a Soldier, and Adams’s own Doctor Atomic. I purchased the original recording of the opera soon after it came out, but hadn’t listened to it in a long time before bringing it out last week as a refresher before seeing it. Sanford Sylvan still amazes in that recording in the role of Chou En-lai. I do wish I had seen it them so I could better compare and contrast impressions. It’s so much different to hear and see it 25 years on, now that I’ve visited China, conducted in several concerts by a survivor of the Cultural Revolution. I still like the opera enormously, and will be ever grateful to Peter Sellars for his role in bringing this work to life. If you haven’t seen this opera and you’re in the San Francisco Bay Area, there are four more performances on June 22, June 26, June 30, and July 3. Highly recommended!